The Mountain Goat got off to a great start, with Team Love Nugget out in force: Tessa, my daughter Carolyn and a work colleague, Gina, all came out to see me off, and my other daughter, Hannah, texted me just before gun time to let me know she would be cheering me on around mile three. Even the right leg felt strong and pain free, and I went off confidently down Salina Street, completing the first mile in just over eight minutes. At the Mountain Goat start. Syracuse, NY. May 4, 2014. With my mind on the first elevation that was rapidly coming up, I paid little attention to the routine left-hand turn off Bellevue and onto Summit. 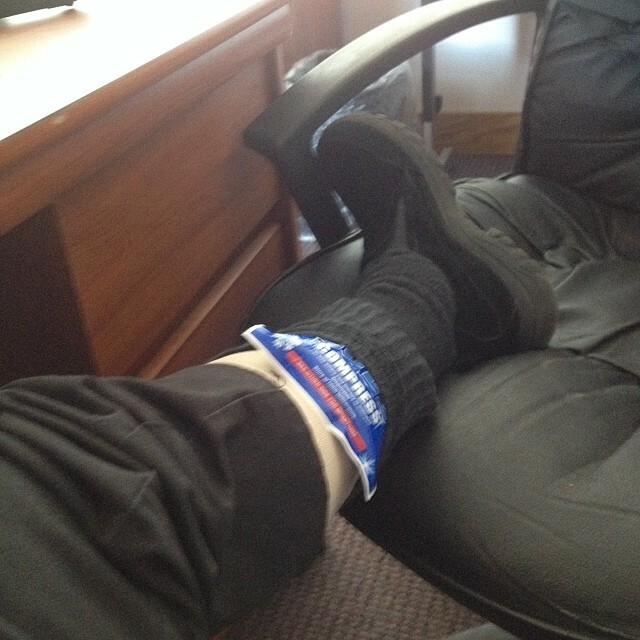 So when my left calf muscle suddenly became hard and incredibly painful, I was quickly jolted out of my groove and began panicking as I tried to figure out what was going on. I hadn’t stepped in a pothole or accidentally stumbled over a curb. If anything, it felt like the worst cramp I had ever experienced during a run (and cramps rarely affect me). So, I reasoned, the upcoming Stolp Avenue hill might change the angle of my foot strike and stretch out the calf muscle. I would be back to normal in no time. Trying as hard as I could to run as fast and as normally as possible, I tackled the first hill and rounded Woodland Reservoir just 30 seconds off my BQ pace. Shortly after, the promised appearance by Hannah and her Grandma and a nice long downhill through the Strathmore neighborhood gave my time and spirits a big boost. I was almost half way, and despite the ever-present pain, I felt very confident I would make it to the finish. The hard slog up Colvin Avenue took its toll physically, as I expected, while the long straightaway on Comstock past the University proved to be a mental grind. Still the pain continued, but I pushed my pace through the brief elevation at Thorndon Park and finished strong and fast on the long downhill mile that brought me back into downtown and over the finish line. Once the race adrenaline wore off, the full extent of the damage I had done to my calf became evident. Within minutes, I could barely walk. Getting up and down curbs proved to be a massive effort–even the walk to the bathroom after the first traditional post-race beer seemed to take forever. Thankfully, Nurse Tessa came to the rescue, and I spent the rest of the afternoon on my couch at home enjoying some TLC, a cold beer or two and RICE recovery. But serious questions now had to be answered. 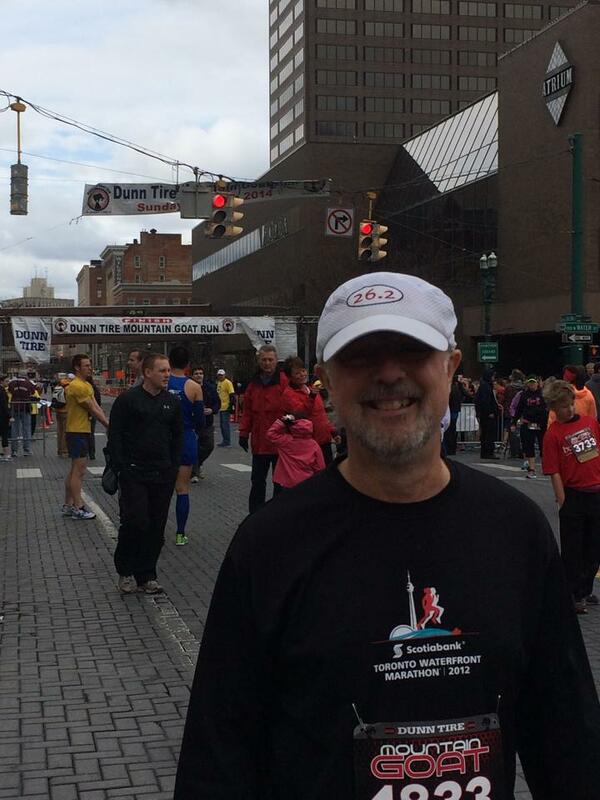 With just three weeks to go, even I had to admit that the BQ dream was dead. But so, too, seemed to be the whole idea of running Burlington. At work the Monday morning following the Mountain Goat. May 5, 2014. This entry was posted in The Flat-Footed Fox and tagged fitness, long-distance running, running injury, Syracuse Mountain Goat, Syracuse NY. Bookmark the permalink.